From the outset, Fuse feels like a familiar game—it mixes some of the best ideas from a bevy of other titles into a futuristic third-person shooter. Think Borderlands meets Bulletstorm with a dash of Uncharted. That sounds sweet on paper, but Fuse proves that it takes more than a list of good ideas to make a game worth feeling excited about. Fuse tells the story of an elite team tasked with retrieving a highly dangerous energy source (Fuse). Fuse was meant to be a renewable energy source. Instead, nefarious folk found a way to weaponize the power. What a surprise! Also not surprising: things don't exactly go as planned on the your initial mission, and that's the reason you're pulled through a number of locales as you chase after comically one-note villains who threaten to destroy the world with the all-powerful Fuse. You, too, have access to that same power. Fuse is a class-based shooter, and in practice this means that each squad-mate gets a unique Fuse-powered weapon in addition to unique powers—both of which can be bolstered via a skill tree. These weapons are probably the most distinguishing characteristic for the otherwise forgettable characters, a fact that's disappointing after playing games like Borderlands—which is also a class-based cooperative shooter with awesome weapons and RPG elements. The leader if the group, Dalton Brooks, has portable cover—a "Magshield"—which can absorb, and then repel any projectiles it traps. Isabelle Sinclair, a redhead that looks suspiciously like the siren in Borderlands, is a character with access to a "Shattergun"—a weapon which can crystallize enemies. Izzy can also deploy a med beacon which can heal and revive team members. Naya Deveraux wields a "Warp Rifle," a weapon which can create singularities, in addition to being able to go invisible. Finally, my personal favorite is Jacob Kimble, a former LAPD detective which uses an "Arcshot," a crossbow which can liquify enemies. These weapons, for the most part, are unique and powerful—and unsurprisingly, limited in use. The game would be hilariously broken if we were allowed to use Fuse weapons all the time. So I found myself using the other weapons more often than any of the special Fuse weapons, which normally wouldn't be a problem…except that the normal weapons feel almost indistinguishable from one another in everything except for fire rate. It's a drag. Under ideal circumstances, players are expected to use a character's unique abilities for team work and coordination. You might, for example, have Izzy crystalize an enemy, and then have another character shatter that enemy with a normal weapon. Such tactics could be coordinated with teammates if you're playing co-op, or hypothetically, could be used by the players themselves. Fuse allows players to switch between characters at the touch of a button, which is a neat ability that I admittedly didn't use very often. Not unless my character of choice was nearly out of ammo, anyway. Fuse awards points for every kill, and these points increase if you coordinate attacks with your teammates. A kill is worth more, for example, if you attain it while behind the Magshield. The genius of Bulletstorm's scoring system, however, is that there are a number of entertaining and unique ways to kill enemies, and players can't simply repeat the same type of kill over and over again for the same number of points. Fuse, on the other hand, will always award you the same number of points on a kill no matter how many times you do it, and seems to only have a limited number of tactical power combinations. Granted, there didn't seem to be too many tactical combinations to explore with buddies, playing co-op is still a smoother experience than playing alone. Human beings aren't clueless AI, after all, and you'll likely be able to go through levels at a quicker pace if you play co-op. The game seems built with the idea that you'll play with someone else. Regardless, I also eventually stopped paying attention to the scoring system and unique combinations altogether at one point, and instead focused on the most effective method of killing enemies. Which is to say, I felt like I turned my brain off while playing Fuse. The fact that it felt like I kept experiencing the same things over and over, only with a different decor (ice level! space level!) didn't help. Every level has three basic elements: arenas, sneaking areas, as well as Uncharted-style climbing sections. Aside from the difference in location—which is only a surface-level difference—many levels felt constructed the same way. You'll encounter most of the enemies the game has to offer early on and as you continue the biggest difference you can look forward to might just be that that enemy now has a shield over it or something. These generic bullet sponges didn't feel particularly smart, although they will rain down on you in mindless droves. When the characters make quips about endless enemies, I couldn't help but nod with fatigue. This was another reason I felt like I turned my brain off as I held the "shoot" button down while playing Fuse. The pacing with enemy encounters also felt off. Boss battles, for example. These often entail time-consuming battles against mechs, only to have the game throw another grueling wave of enemies at you right after those boss encounters. Sometimes that wave would even be followed up by yet another mech. And finally, just when I thought you'd get some time to breathe, a bunch of enemies will spawn on the elevator/room you need to exit in. This made enemy encounters feel like jankily-paced tedium. Between these segments, Fuse will sometimes ask you to sneak and climb your way through it. The sneaking sections aren't well realized—think more Metal Gear Rising than Metal Gear Solid. Put another way, levels seem designed more for head-on encounters than furtive playthroughs. The climbing sections, meanwhile, are entirely forgettable and don't add anything to the mix. 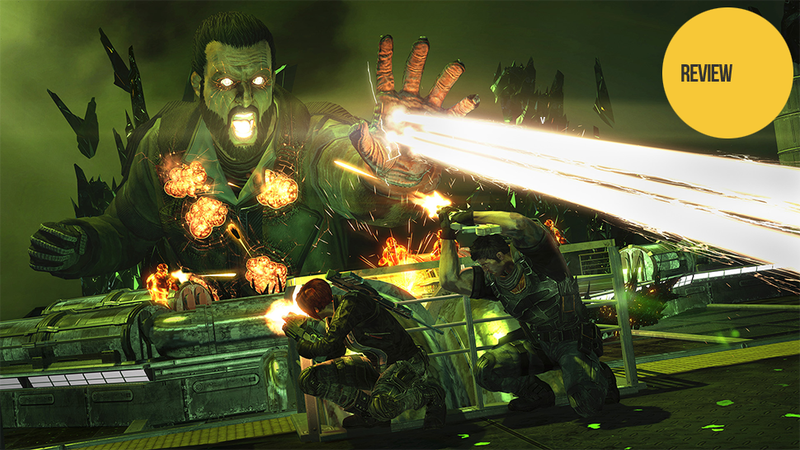 Fuse also features an "Echelon" mode, otherwise known as 'this game's version of horde mode.' In many ways, it feels like campaign mode except without the (completely disposable and cliched) story, and with objectives that tended to keep things interesting. I didn't get very far with my attempts to play the mode on my own—its difficulty seems tuned for more than one player—but I can't help but wonder if players wouldn't be better off skipping the campaign and sticking to Echelon. So many of Fuse's elements—from the squad-based co-op play, to the role-playing elements—seem like the ingredients necessary to make a Good Shooter (according to the almighty focus group, anyway). And indeed, many shooters see adding these same features as a way of keeping up—resulting in very samey titles. Fuse's familiarity is not surprising, although although in Fuse's case, the feeling is particularly potent. It's almost like you need more than a palatable feature list to have a worthwhile game.